Usually, in most holiday destinations, travellers and locals don’t really meet. A local may serve coffee or hand the keys to the hotel room. But they don’t have the chance to talk much or get to know each other. Thus, cooking classes in Vienna ‘s private homes aim to bring hobby chefs from all over the world to a common table. In Austria, they say, “beim Essen kommen d’Leit zam”, which can be translated with “eating brings people to a common table”. 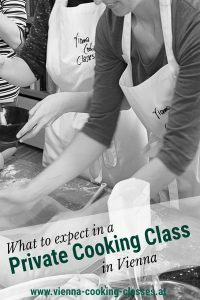 Thus, Vienna Cooking Classes, are dedicated to the idea of bringing tourists and locals to a common table. “Nice!” You may think, but still you may not really know how such an event will look like. 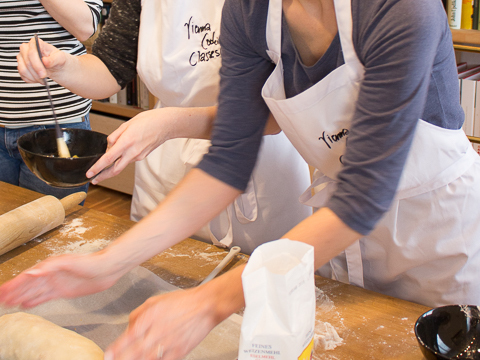 In hands-on culinary workshops you will learn how to prepare Viennese dishes from scratch. You will be able to sneek into Viennese everyday life and the local’s way of living. The idea of Vienna Cooking Classes is not only to to learn about how to make popular local dishes, rather than having an exchange between different countries and cultures. So you will be able to ask your host whatever you wanna know about Viennese lifestyle, culture and cuisine. Anyways, you will eat dishes like Schnitzel and Apple Strudel that may taste much better than in our local restaurants and coffee houses. Because hosts will share their own favorite recipes with you, probably even long-kept secret granny recipes 😉 And of course, homemade tastes always best! what day and time would you like to book a class? for how many people do you want to book the class? would you like to keep the class private or can we open it for others to book as well? Previous Previous post: WANTED: HOBBYKÖCHE IN WIEN FÜR DIE LEITUNG VON KOCHKURSEN!